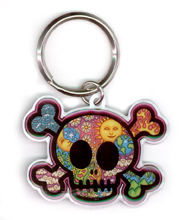 New design, now in a metal keychain! This cute skull has a patchwork of classic Morris designs including celestial images, clouds, waves, hearts, tribal flames, leaves, flowers and mountains. Size: 2"x1.5" Artist: Dan Morris.